Zion Market Research has published a new report titled “Macadamia Market by Application (Food Industry and Cosmetic Industry): Global Industry Perspective, Comprehensive Analysis, and Forecast, 2017 – 2024”. 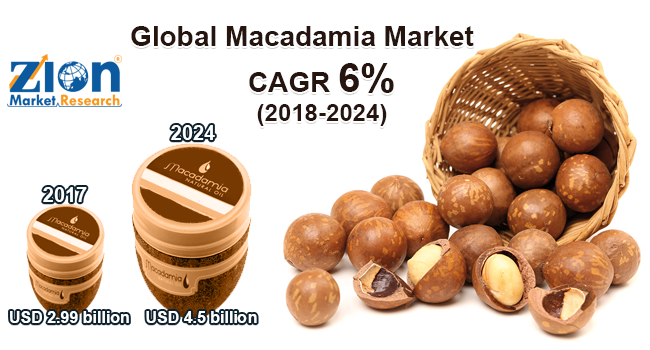 According to the report, the global macadamia market was valued at around USD 2.99 billion in 2017 and is expected to reach approximately USD 4.5 billion by 2024, growing at a CAGR of around 6% between 2018 and 2024. Macadamia nuts are buttery flavored nuts obtained from macadamia tree. Macadamia nut trees are usually cultivated and harvested in the tropical climates of Brazil, Indonesia, New Zealand, Australia, South Africa, and Kenya. There are only two species of macadamia considered edible. Macadamia nuts contain a wide range of healthy nutrients such as protein, carbohydrates, niacin, thiamin, iron, riboflavin, and vitamin A. Macadamia nuts also possess anti-inflammatory, antimicrobial, and antioxidant properties. The macadamia market is anticipated to witness substantial growth within the forecast period. The market is mainly driven by increasing demand for macadamia in the cosmetic industry. Owing to its high nutrient content it is widely used in the production of desserts, cookies, chocolates, cakes, and other confectionery products. This, in turn, is expected to boost the growth of the macadamia market during the forecast period. However, the production of macadamia nuts to the extent that will meet its increasing demand is not possible as they are difficult to propagate, limited in the range of cultivability, and slow to bear. This, in turn, makes the final product costly and hence is expected to restrain the growth of the macadamia market during the forecast period. The market can be segmented on the basis of application in the cosmetic industry and food industry. In the cosmetic industry, macadamia is used to manufacture natural and organic cosmetic products. Oil of macadamia nut is non-volatile and delivers optimum benefits to hair, skin, and body. The high content of oleic acid and palmitoleic acid makes macadamia suitable for sun care creams and thick body lotion formulations. Owing to certain health benefits of macadamia nuts such as it helps in reducing the risks of heart diseases, fights against free radicals and cancer, increases metabolism and is a power supply of antioxidants and omega-6. It is used in the food industry to produce a wide range of confectionery and dairy products. Macadamia nuts are consumed in a variety of forms through diets, such as roasted nuts, organic nuts, salted nuts, chocolate covered nuts, macadamia flour, and dry nuts. In 2017, Asia Pacific emerged as a primary region in terms of demand for macadamia nuts and it accounted for over 26% share of total revenue generated in 2017. The market growth is essentially due to increasing health awareness and rising consumption of dried fruits and nuts through diet in countries such as India, China, and Japan. Further, increasing population coupled with high disposable income is expected to boost the demand for macadamia nuts in the Asia Pacific. The Middle East & Africa is another key regional market and is expected to show significant growth in the near future on account of the growing middle-class population coupled with the increasingly busy lifestyles in the countries such as Turkey and UAE. North America is expected to be the fastest growing macadamia market owing to a high standard of living. The major market players in the global macadamia market gained a significant share of the market in 2017. The leading companies have been investing in technological advancement, quality standard maintenance, and product innovation in order to retain existing customer base and build new market opportunities. Some of the leading players are Golden Macadamias, Hamakua Macadamia Nut Company, Nambucca Macnuts Pty Ltd., Royal Macadamia (Pty) Ltd., MWT Foods Australia, Kenya Nut Company Ltd., Wondaree Macadamias, Mauna Loa Macadamia Nut Corp., MacFarms, and others.